Taste of ArtWeek, a kick-off celebration to Franklin ArtWeek, announced today that La Cantina Winery, Jack's Abby Craft Lagers, Exhibit 'A' Brewing Company, Crue Brew Brewery, and Zelus Beer Company will all be featured in their beer and wine garden. The festival is on Saturday, April 27 from 4:00 - 8:00 PM, and will also include food trucks, a craft fair, and free live performances on the Franklin Town Common. The beer and wine garden and a fine art exhibition will be held across the street at Hayward Manor. 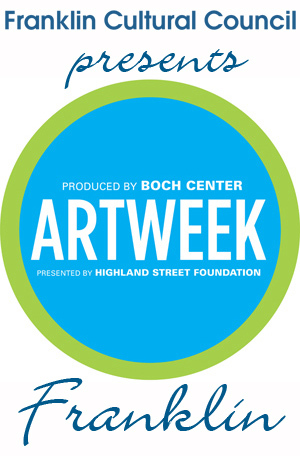 Taste of ArtWeek is intended to give attendees a "taste" of what ArtWeek is all about. Beer and wine garden tickets are $20, and will provide guests with either a flight of six tastes of different beverages, or two full pours. Tickets can be purchased in advance, starting April 1, at www.randomsmile.org/festival. "As a local resident of Franklin and owner of the winery in Franklin, I am thrilled to take part in this community event. The town has been very supportive of our winery and it’s great to see them allowing food trucks and a beer/wine tent. Our award winning wines are produced and bottled in Franklin with grapes sourced from California and Chile. It is our mission to work with all organizations in town with efforts in supporting the community. We are honored to take part in ArtWeek, especially in the town we call home." says Bob Vozzella, owner of La Cantina Winery and one of this year's festival sponsors. Taste of ArtWeek is being organized by the Franklin Cultural Council, in partnership with Random Smile Project charity. Proceeds from the event will benefit both organizations. More details on this and other ArtWeek events can be found online at www.artweekma.org. About the Franklin Cultural Council — The mission of the Franklin Cultural Council (FCC) is to encourage participation and enhance opportunities for enrichment in the cultural arts and sciences throughout our community. Comprised of committed residents, the FCC meets monthly with the purpose of supporting events and programs through grants from the Town of Franklin, the Massachusetts Cultural Council, and the National Endowment for the Arts.